In a gritty personal account written by author Terry M. Sater, a sailor who manned automatic weapons during the Vietnam War, The Nightmare of the Mekong depicts the intense combat on the rivers, streams, and canals of the Mekong Delta. 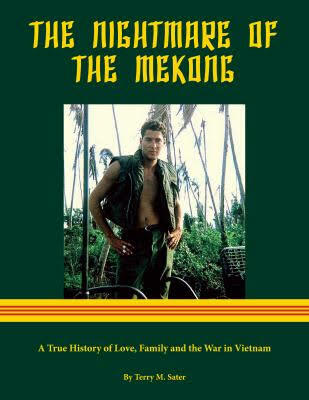 Utilizing official summaries, Operation Reports, and military historical records, Sater weaves together an intensely personal history of the war that provides a vivid picture of the savage fighting that took place between Viet Cong guerrillas and the U.S. Navy. “Wednesday, October 23rd, Group Alfa fought a Viet Cong platoon, seven miles southeast of Ben Tre. Both U.S. Army and Vietnamese Marines were still in contact after darkness. Nine Viet Cong were eliminated and one AK-47 was captured. Fighting broke out at 1020 when helicopters carrying Alpha Company, 3/60th Infantry hit a hot “LZ”, landing zone. One infantryman was killed and a helicopter pilot was injured in this first attack, as the “slicks” (helicopters) landed the troops in the area. Choppers continued to draw fire during the day. Three Huey’s and one Light Observation Helicopter were shot down. U.S. ground forces were the target of two enemy mortar attacks during the afternoon and the troops were frequently pinned down by V.C. automatic weapons and rocket fire. As the fighting intensified, Delta Company, of the 3/47th Infantry was airlifted into a Landing Zone south of the enemy. At the same time, River Division 91 brought two companies of Vietnamese Marines into the battle via the Ben Tre River, through an ambush of rocket and automatic weapons fire which wounded one assault boat crewman. The Marines were beached one kilometer north of the fighting and achieved almost immediate contact as they swept south. On the same day, River Assault Squadrons 13 and 15 were transporting Vietnamese Marines and ARVN’s in the Can Tho area. During the day, boats of Riv Div 152 were beaching the troops on the Cai Con Canal, about twelve miles southeast of Can Tho, when a grenade was suddenly hurled from the east bank. It landed on T-152-11, slightly wounding two crewman and blowing a ten-inch hole in the helo deck, next to the coxswain’s flat. The boats immediately fired back with 20MM cannon and small arms fire. By mid-afternoon, the Marines had rounded up ten Viet Cong and the boats had inspected twelve sampans. Please let your friends know there is now a website for my book, “The Nightmare of the Mekong,” which provides a way to purchase the book through “PayPal.” The cost shown of $23.50 includes taxes and the cost of shipping within the continental U.S. Shipping outside of the U.S. will require an additional charge of $23.50, for international shipping. The other option is to send a check for $23.50 (shipping within continental U.S.) to Terry Sater, P.O. Box 2, Eureka, Mo., 63025.